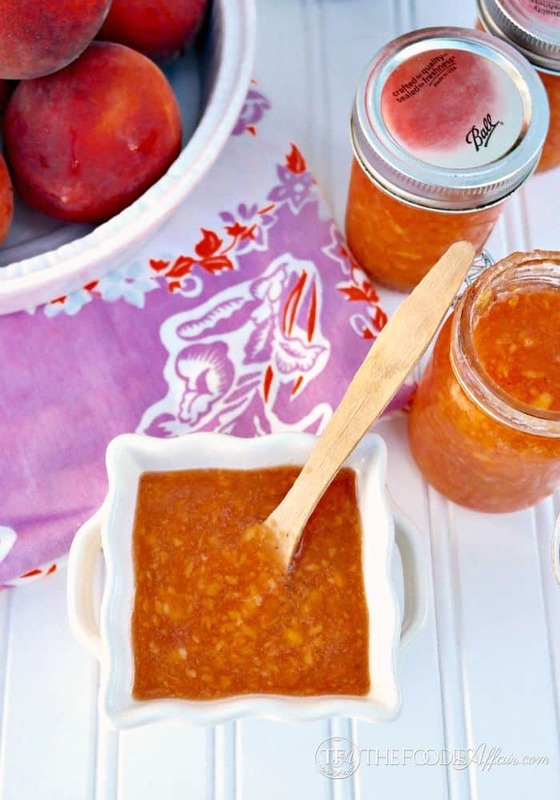 No special equipment is needed for this easy peach freezer jam recipe. Enjoy fresh summer fruits all year long. 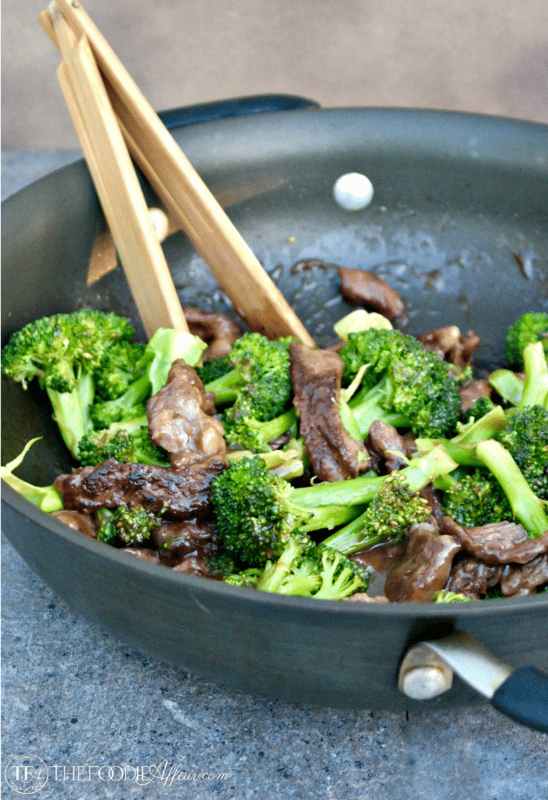 Add to sweet or savory dishes! I’m trying to hold on to the summer season as long as possible: long walks on the beach, bike rides at dusk, grilling out as much as possible, and making sure that I eat my fair share of PEACHES! Glorious peaches! 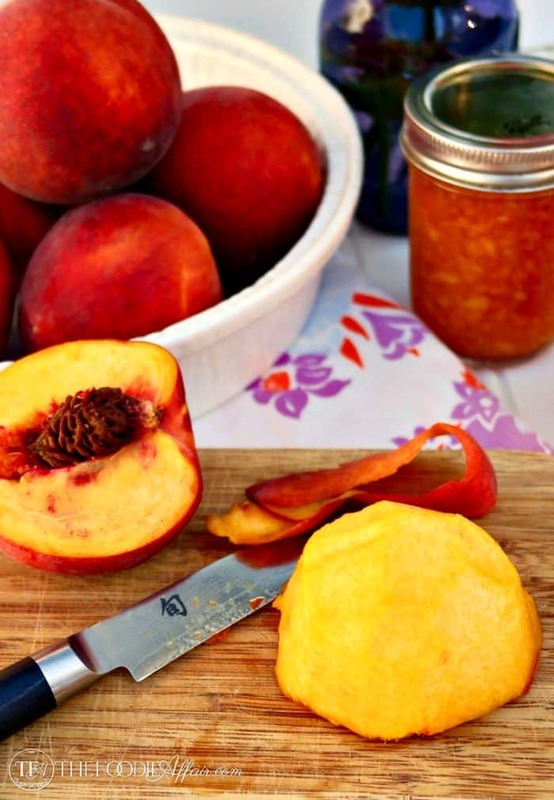 I hit the goldmine with the juiciest and sweetest tasting peaches EVER and during one peach fest as the juice dripped down my hand I decided that I better preserve some of this goodness! I’ve made strawberry topping and blueberry sauce before, but this time I thought I would try my hand at adding pectin specially made for low-sugar preserving to help thicken up the sauce instead of hanging out over the stove. 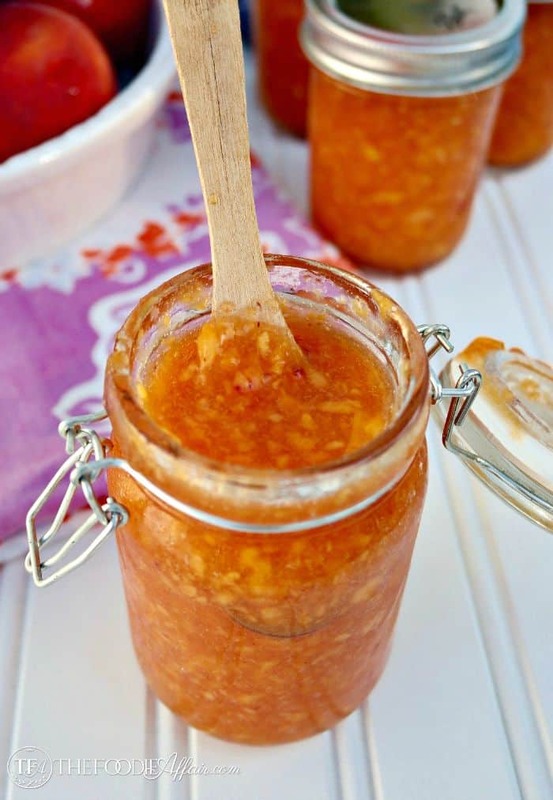 I wanted the quickest and easiest way to make a jam, and if you follow my lead you’ll have this peach jam in less than 30 minutes! I really, really suggest you pick the best tasting peaches. If you find that the texture of the peach is grainy, dense and unsweet then that’s just all wrong for preserving (or enjoying anytime!) because you’ll end up adding a lot of sweetener to make up for the flavor that’s missing and that’s just ewwwy-icky, so pass on those unfit peaches. I picked mine up from the produce stand near my work place, and they must have been picked right off the tree because they are delicious! It takes about 6 peaches to make this batch and I added 3/4 cup of sugar. I probably could have used less, so I suggest adding it a little at a time while tasting. With low sugar pectin (I used Ball brand) you can also use honey or a sugar alternative like xylitol if you would like. My peaches were perfectly ripe, so there was no need to remove the skin by dipping them in hot water and then an ice bath. I took my paring knife and removed the skin easily. I pulsed the peach flesh in my Ninja blender, but you can use a potato smasher as well. 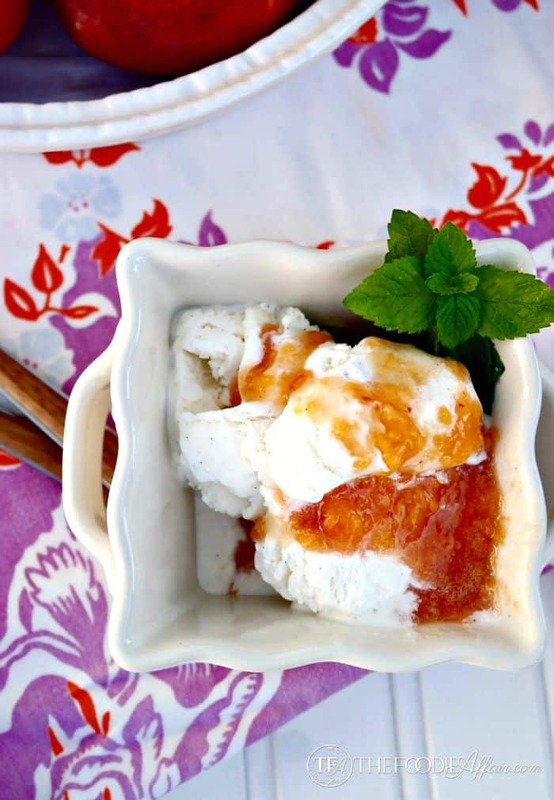 There are so many delicious ways you can enjoy this freezer jam! Over ice cream is amazing! Feel like making your own fruit on the bottom yogurt? This is so good with Greek yogurt. Pork Chops with Peach Jalapeno Sauce from The Foodie Affair. What would you use this peach jam for? 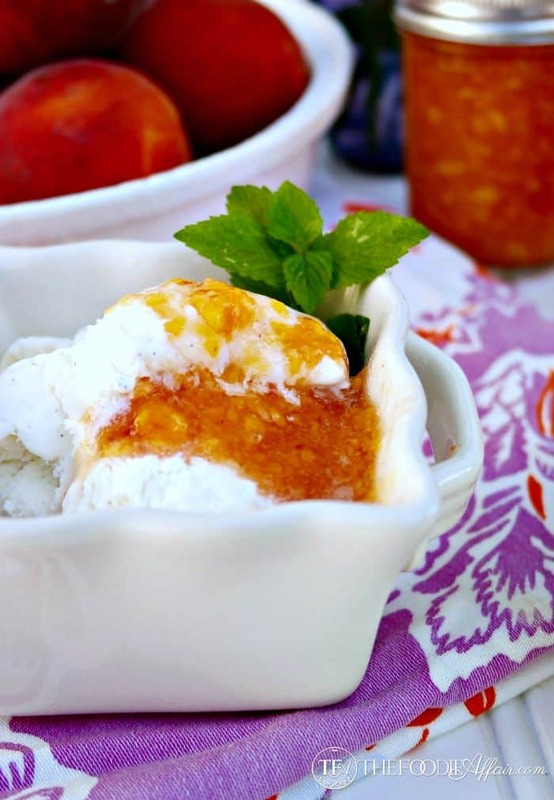 Enjoy the summer peaches all year long with this peach freezer jam and add to sweet or savory dishes. Pit, peel and dice peaches. Place in a food processor or blender and pulse to the desired consistency. Put in a large bowl and add lemon juice and sugar. If your fruit is very sweet, then you may use less than a cup of sugar. Adjust to your taste. In a small sauce pan add water and gently add the low or no-sugar pectin (I used Ball brand) and stir until completely dissolved. Bring to a full boil while continuing to stir. Bring to a rolling, hard boil and cook for 1 minute. 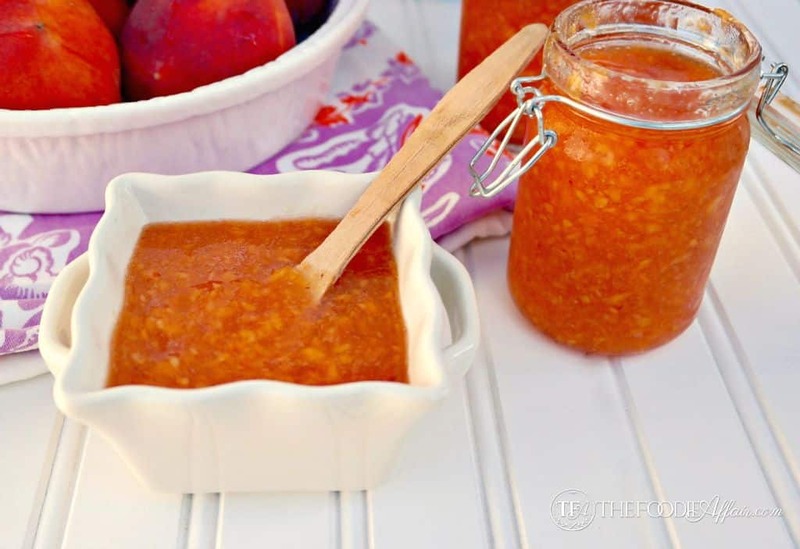 Pour into prepared peach mixture and stir until well incorporated (2-3 minutes). Add in vanilla. Pour into prepared 8 ounce jars leaving some space at the top so the jam can expand during freezing. Cover with lids and keep at room temperature until cool. Store in the refrigerator or freezer . Jam will keep fresh in the refrigerator for about 3 weeks and in the freezer for 1 year. Love this sweet and delicious jam. Holding on to summer …but alas my boys have started school today. I am sure the complaining will be commencing shortly… LOL I would love a warm scone slathered with your jam for breakfast any day of the week. Pinned my friend! 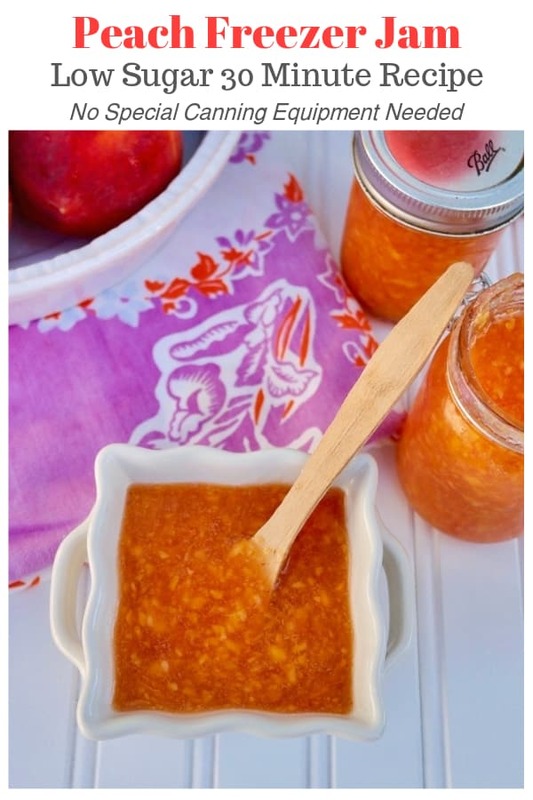 Perfect duo – scone and peach jam! Best of luck with getting back in the swing of things. Summer sure did go by fast! I love this time of year while the peaches are ripe. Great recipe Sandra, I can’t wait to try it. Thanks, Sarah! Peaches will still be available for another month or so. Get them while you can! What a wonderful way to save this year’s great crop of peaches! Nice and sweet and for only 99 cents a pound I just had to find a way to enjoy peaches all year long! I have never had peach jam before. I love peaches, so I think I need to try this. I’ve been wanting to make jam but didn’t want to mess around with canning. Love that this is a freezer version. Sounds like something I could do. All about controlling my sugar which makes it even better. That just screams of summer! I can’t wait to make some of it myself! 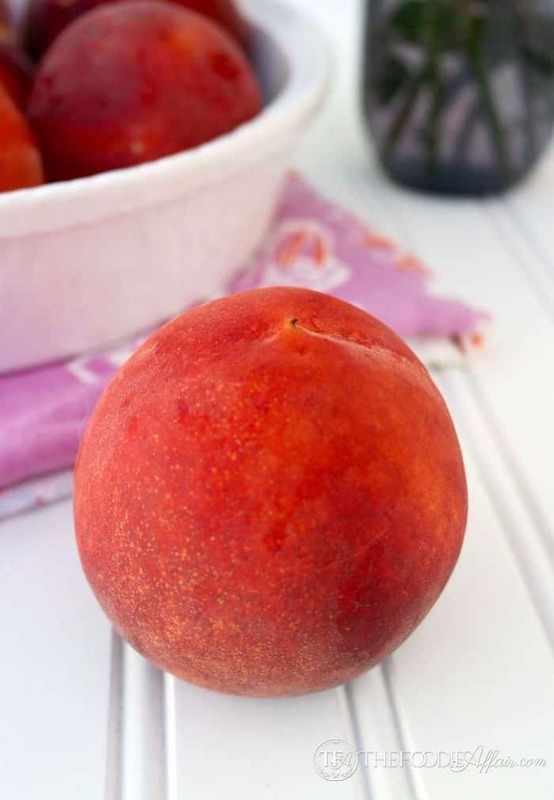 Good tip on picking the right peaches from the get-go to avoid havig to use sweetener later. I do love tasty sweet peaches! Peach jam is one of the tastiest things, and the peaches have been perfect this year haven’t they! 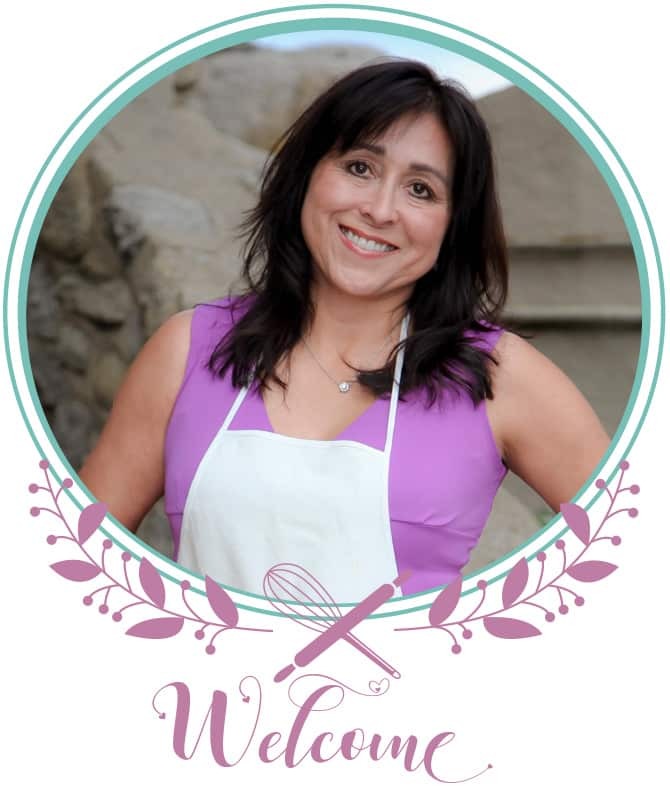 Love this recipe Sandra, will have to give it a go! Homemade jam is the best! I can’t wait to try this recipe! This is such an easy to follow recipe and I’m so happy to have found it. I love that I can enjoy wonderfully sweet jelly made from fresh produce so quickly and easily.